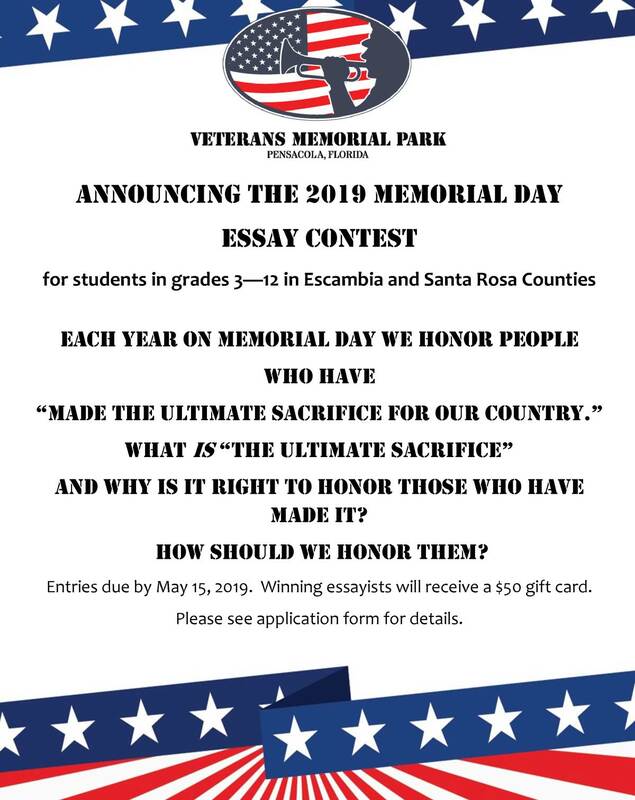 The Veterans Memorial Park Foundation of Pensacola is pleased to announce an essay contest for 3rd to 12th grade students in Escambia and Santa Rosa Counties. Students in public, private, or home-school settings are eligible to participate. Essays are due by May 15th and winning essayists in each grade will be awarded a $50 gift card. Winners will be recognized at the May 26th Memorial Day Ceremony at the Veterans Memorial Park in Pensacola. The annual essay contest is just one way the Foundation completes its mission of educating the community about the sacrifice of those memorialized in the park. The all-volunteer Foundation also hosts ceremonies for both Memorial Day and Veterans Day. They provide presentations and assistance to military groups who visit the Park during reunions and other gatherings. They raise funds to pay for the upkeep of the Park and all the monuments contained in the park. “Of course, the members of the Foundation and volunteers also pitch in and do a lot of the work themselves,” adds Hansen. To find out how you can help support the Veterans Memorial Park Foundation contact Ms. Lee Hansen at 850-434-6119. The Veterans Memorial Park Foundation Pensacola is a 501(c)(3) non-profit organization.